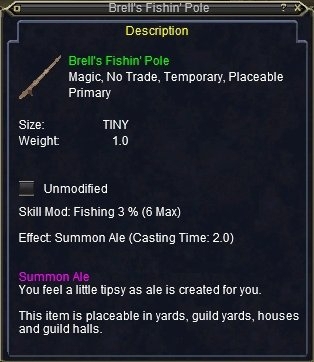 Brell's Fishin' Pole was made unbreakable with the patch of July 18, 2018. It does not have the Expendable tag. Get 2 Nightmare Cichlid Bones and 2 Vallorian Discus Bones, either by buying them from the Bazaar or by fishing and preparing them. Then hand them *unstacked* to Ramos Jerwan (a barbarian near the pool in Plane of Knowledge at location -30, +1430) so all 4 slots of the trade window are filled. In return he hands you the Fisherman's Companion. Anyone know if Fishing mods stack? According to EQ Traders, no skill mods stack. You simply get the highest one. I'm not sure where on EQ Traders you found that. It's a big site and I'm sure someone has said that at some point though. The trouble is, categoricals are usually wrong. From what I can tell, mods to the lockpick skill stack at least in some contexts. A rogue can wield mechanized lockpicks, hold a second set on the cursor and open doors which normally would not be budge with just one set. I recommending checking skill by skill. I tested with a Collapsible Fishing Pole and some Circular Fly based on Pixie wings. I could check my effective fishing skill by opening a tackle box in the new UI. It showed the effect of each mod separately to be visible and large enough it wouldn't be lost with rounding. (You can't see the effect of either one with a skill under 20.) The two together gave exactly the same effect as the higher item. My assessment based on personal experience agrees with the previous assertion: Fishing modifiers do not stack. Finally! A solution for when I spill my beer while fishing! A man said to the universe: "Sir, I exist!" has not created in me A sense of obligation." Summon a fishing pole to summon ale..
As I was saying.. Huh ? Life wasn't meant to be easy, but who put me on the Hard setting ? You haven't walked straight in days? Dear...<lowers her voice to a hush> the fishing pole is supposed to be used for fishing, and getting drunk. What were you doing with it?! ?